The morning started off with one of the most beautiful sunrises I have seen in a while. The flags were hanging motionless on their masts as I passed the USCG station at Indian River Inlet. All were good signs that it was going to be a great day. There were thin clouds to the east, reflecting the red and purple rays of the sun. I had to do some searching to find the Surface Interval in the Marina. I had printed the wrong portion of the driving directions, and did not know which dock to find her on. But once the purple and red of the sunrise lit up the sky, I was able to navigate the docks and find the proper slip. The Surface Interval is a 47ft Aluminum boat outfitted well for diving. The back is covered with a canopy sheltering divers and gear from sun and rain alike. The midsection has an upper and lower deck. Below are several rows of benches which can double as racks for the shorter members of the group. (I’m not so lucky.) The upper section is has benches on each side with more storage underneath, and an open middle. The front section of the boat is the pilot house, with a rack right behind the skipper. Since she makes 20+ knots, the 30 mile trip to the Northern Pacific was shorter than expected. Several of us sat above and discussed the wreck with the local SCUBA veterans. We watched as the dolphins danced in our wake, escorting us out through the inlet. Others made use of the rack like benches below. I spent my time listening to the various descriptions of the site, what could be found, and what should be expected. The wreck is upside down starting at 110ft and resting on the bottom at 140ft-150ft. There were many small holes in the hull, and one large open tear was some 30ft tall about amidships. To the one side there was a debris field which had once been the superstructure of the ship. Anchoring was usually into this debris, as anchoring an upside down hull was very difficult. The ship could be easily penetrated through the main tear. 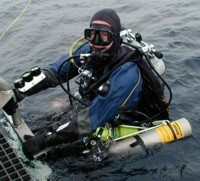 The group that day was comprised of divers from New York, South Jersey, Delaware, and Virginia. One group of DIR divers was scheduling a video shoot of an extended penetration dive. Others were there in search of artifacts. Some, like me, were just there to see the wreck. With my nickname of The Great White Hunter, I was disheartened to find that seabass and tog were both out of season in Delaware. The wreck was not known for lobster, was too deep for trigger, and scallops were unheard of. This left me with a sight seeing tour of the wreck. With hopes that there would be enough light for video, I had charged up the camera batteries. I started to the final assembly of the housing. Once on the site, the captain hooked the wreck quickly, and the mate hopped in the set the hook. The divers started to gear up as we waited for the final word that the hook was set. Once the deck had cleared enough to gain access to my tanks, I started to gear up. 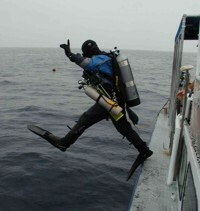 Trish, one of the boat’s crew and webmaster, was taking pictures of the divers as the prepared for the giant stride into the deep. Fighting the digital camera lag, she was trying to get someone in mid stride hanging over the water. I told her I had not done a giant stride entry in a while, since we usually roll in on most of the boats in NJ. I tried my hand at it, and she caught me stepping off. Once in the water, Capt. Darryl handed down the camera, and I started down. The surface visibility was incredible. The mate and some of the other divers were already headed back. They could be seen down to 80ft in the bright, clear water. There was next to no current, as I swam down the granny line. Unfortunately, I did not get any video footage of the other divers under such great conditions. The thermocline was at 80ft and the water got much darker. The temp dropped from 72 to 50 passing through 90ft, 100ft to 110ft. Suddenly the wreck became visible below. The anchor line continued down, but I was already over the hull. The anchor was in the debris field to the side of the wreck. The hull was right below, half covered in anemones. I quickly descended to the debris field at 130’ and took a few seconds to evaluate the conditions, and adjust my buoyancy and gear. Quickly adjusted to the light, I could easily make out the shape of the wreck. The visibility was easily over 40ft, and there was no current or surge discernable. With the massive hull as a guide I decided against a reel, which would have made video very difficult. I headed a few yards out from the anchor and found the beacon on the line quite easy to see. Switching the camera on, the search for subjects began. While there were some mussels on the hull, there were also huge starfish clearing them off. Ling were all about the wreck. Some were quite large. Adult and juvenile eelpout littered the debris. Some were in holes under the plates, but several were sitting out waiting for their picture to be taken. Several large tog made a point of mocking me as they swam by. As usual the large quantities of cunners swam around the openings in the wreck. I had turned to the right off the anchor line which took me aft. At the stern were the three large shafts where the props had been blown off during salvage operations years ago. The far side of the wreck was uninteresting with no debris or holes. I turned and headed back toward the anchor. I could quickly see the beacon far off in the distance marking the anchor location. This is always a comforting sight. Approaching the line, the three man video team could be seen descending the line preparing for their dive. I took some footage of their approach. Despite the dive brief, a 3 lb lobster made a point of jumping in front of the camera lens. After taking a few seconds of video, he was invited back to the boat to meet the rest of the crew. Apparently he had not listened to the brief. Time was up for the first dive, thirty minutes of bottom time. Now it was time for the long ascent. Thirty more minutes of deco. Deep stops were short, and the 80ft stop was right at the thermocline. The warm water felt good. It was 50 deg on the bottom, and 72 on the surface. Most of that change occurred between 70ft-80ft. Once cleared to the 70ft stop, the boat could be clearly seen above. Other divers were visible hanging on the line and deco bar. A quick gas switch at 70ft then there’s not much to do but spend a lot of time staring at the bottom timer. Approaching the shallower stops, equipment lines became clearly visible hanging from the port side of the boat. Scooters, tanks, hammers and catch bags hung bouncing on the lines. I could see that others had also found lobster on the wreck. One was quite large, five lbs maybe. Small jellyfish floated slowly by. There was not much current, but the boat was swinging back and forth on the anchor line. One minute you were on the left of the line, the next minute, you were on the right. Normally this is not much of an issue, but with a camera, deco bottles catch bag, and reels, you could easily snag the line. Deco time was up. Now it was time for the worst part of the dive, getting back on the boat. I should have hung my own equipment line over the side. It would have made me lighter. Once on the ladder, it was evident that the wind had picked up a little. The calm seas had turned to 3ft. Not too bad, but hold on tight to the ladder. Trish wanted one more picture, so I tried to smile (tough to do with a reg still in my mouth). The surface interval went quickly. We ate, and talked. Trish brought out home made pumpkin bread. We swapped sea stories, discussed wrecks and gear configurations. The video team returned, and described where they had gone inside the ship. From all of the discussion, it was apparent that the main tear in the ships hull was to the left of the anchor. That was the destination on the second dive. We began to gear up and drop into the water. No fanfare this time, just drop in. On the way down it was evident that the current had picked up. The seas were still about 3ft, but you needed to hold onto the line on the way down. At the thermocline, I could see the bubbles rising from another diver. They were coming straight up until they cleared the thermocline, then they continued up and to the right at a 30deg angle. An interesting effect, again I did not think to get footage of it. The bottom conditions were unchanged. The sun had been in and out all day and right now it was out. There was more light, and the camera appreciated it. Headed to the left, the tear in the hull was only 50ft away. Maybe 30ft high and 20ft-30ft across, it was an inviting sight. Without proper gear or training though, I passed on the opportunity after taking some footage. The long swim to the bow of the ship was rather uneventful. The debris was not as dense up there, but the anemones on the hull seemed thicker in the brighter light. The ship was 500+ft long, so the trip took a while. The remainder of the hull appeared to be intact.The eelpouts were out in large numbers. They sat on the bottom rather than hiding in their holes. Large tog continued to mock me as they swam lazily by. Out in the sand was found a lone scallop. Excited, I took a bearing and headed out further into the sand, but to no avail. I had the only scallop on the wreck. Time went quickly, and the long swim had increased my deco obligation. I cut the dive short by a minute or two as the beacon came into view flashing off in the distance. I headed up and over the top of the hull, rising slowly to intercept the anchor line. Deco was a bit more work this time as the current was moving quickly. Hand over hand was the only way to move up the anchor line. The surface vis had dropped to 40ft, and the seas had obviously come up some more. After climbing aboard, Trish jumped in to pull the hook. The seas had come up to 4+ft. We all stowed our gear and prepared for the ride back. All were amazed at the sight of a scallop, and I eagerly stowed it with the lobster in the cooler. The trip back was a bit wet. The leeward side of the upper deck only took some light spray as we exchanged more dive stories. Pulling in, we quickly unloaded our gear and loaded our vehicles. Capt. Darryl announced that the next day’s dive was blown out. We said our goodbyes, and headed for home, but not without the requisite tee-shirt souvenirs. Sunday morning the NOAA forecast read 3-4 foot long period swells, winds 5-10 kt. That can be good and bad. On the surface the swells don’t bother the boat much, but can wreak havoc on the bottom with surge and low vis. The sky was about 50% sunshine with high hazy clouds wondering through. The dive today was off the Spring Tide in Brielle. Capitan Ron and the mate John were on the boat welcoming the arrivals. I had showed up to the dock a little behind schedule, but soon learned the DM was even later. I had plenty of time to load my gear and talk about the upcoming dive. The trip was to the Ayuruoca commonly known as the Oil Wreck. She sunk during the war after a collision. She had been running with her light out to avoid submarine attack. She landed on the bottom in 175 fsw of the mud hole. She was intact and upright with the deck at 150 ft and the masts extending up to 80 ft.
Once my gear was stowed, I sat with the other divers and crew waiting the DM and last two intrepid souls. Once they arrived and started loading gear, I started to notice a few Argon bottles showing up. A quick inspection of the tank labels soon confirmed my suspicions. At least two of the divers were on Mix. Without proper training, air was my limit for this dive. 175 fsw on air, it’s going to be a fun day. Since the wreck was in the mud hole, I had borrowed a buddy’s HID light. I added it to my gear and did some final checks. The boat was soon underway and we hit the racks and benches for the ride out. Some of the group were generating deco tables and writing them down on slates. Others were assembling gear do to the late arrival. When we arrived at the site, there was a fishing boat on the front of the wreck. She waved us in. We anchored behind them. The DM jumped in to set the hook, but was unable to make headway in the ripping surface current. The surface water was brown and cloudy, maybe 2ft vis. We threw him a line and pulled him forward to the anchor line. Soon the bottle was up and we jumped in one by one. After doing a final check and switching on the light, it was my turn. Once over the side I quickly grabbed the down line and started to descend. Once below 5 ft, the vis cleared and the current stopped. The anchor line could be clearly seen for 40+ feet descending into the thermocline below. With the current gone it was a simple task to glide down the granny line to the anchor, then down into the darkness. At 90 ft the HID’s light became apparent as the sunlight was quickly eclipsed by the small particles floating in the water column. At 150ft the deck suddenly came into view in the 15ft vis. There was a slight surge, a very slight current, and it was very dark. As it turns out, we were anchored into a lobster trap. The deck of the ship was littered with them. While waiting on the surface we had seen many buoys off in the distance. Apparently over the years many traps had landed on the deck and been snared by the ship. The deck was now covered in rope and lobster traps. Descriptions of monofilament webs quickly came to mind. Tying off a reel, I carefully started to navigate the deck. Trying to avoid entanglement, I struggled to determine where on the wreck we were located. After a few minutes a railing came into view. Up, over and down to the bottom. The vis on the side of the deck was poor as I waved the light back and forth between the hull beside me and the void below. Soon the bottom came into view. It was dark and muddy. Not much character to it. Swimming a few feet into the light current, nothing came into view. The hull beside me was the only item of interest around. It was encrusted with hydroids and muscles. Large starfish were there to pray on the muscles. Ropes were dangling down from the deck above then off into the distance. Heading back to the deck, the hull did seem to have more character than on the decent, probably just the narcosis fog clearing a little. Once on the deck I did some more investigations of the immediate area around the anchor. There was a mass of rope and traps to the left that prevented me from heading that way. To the right the deck dropped off without a railing to another deck below. We must have been behind the wheelhouse. The time was up for the first dive, so I reeled in my line, and started up the anchor. At the 100ft stop the water started to get warmer. It was 54 deg on the bottom and 68 deg at 70 ft. The vis also cleared. One of the masts stuck above the thermocline, 30ft off the line. This could be clearly seen in the ambient light. Shutting down the HID to conserve battery, I waited out the stops slowly. It was a two deco bottle dive, so the wait was not long. Once at the 10 ft stop the thick surface layer could be seen again. The surface water was dark and brown, thick with jelly fish. From 10ft to the thermocline at 100 ft the water was green and somewhat clear. My guess was that the surface water was brackish water from the Hudson, headed out to sea. This would explain the color and the current. Back on the boat, several divers talked about the monofilament, I had not run into any. We swapped stories of what we saw. It was a long wait for next dive. We were entertained watching the fishing boat try to pull out of the wreck. With all that debris, I don’t know how anyone could anchor and pull out again. It took them half an hour to finally get the hook out. On the way down the line for the second dive, it became apparent that the boat had swung around on the anchor. The line was now wrapped 90 deg around the mast we had seen on the first dive. I was tempted to drop down the mast to the deck, but was concerned with the number of ropes and line hanging from it. I did a quick check to verify that the line was not chaffing on the mast, and went down to the anchor. This time, after tying my reel, I went up and over the rope mass that covered the wheelhouse. The vis on this side was 20-30 ft, but still very dark. There was a little more surge, but the current was still slight. I swam out for a while examining the structure of the deck, and gear. Hoists stuck up from deck and in some places the deck plates were gone revealing the structure below. Hydroids swayed in the surge, cunners darted in and out of the holes in the wreck. Here and there a tog could be seen popping out of the ships structure. The ship was 468 ft long. I quickly ran out of time before I could reach the bow. Turning around and reeling in line, I quickly arrived back at the anchor, untied the reel and headed up the line. The 100 ft stop was right at the place where the anchor line wrapped around the mast. The stop was short, but disconcerting. Most of the time was spent trying to keep rope from ensnaring gear. Back at the 80 ft stop, the top of mast was 20 ft away. The current was such that I was facing the crows nest. Several large tog were circling it with many cuunners and small fish hiding in the web of rope. Looking closer there was one huge tog swimming slowly, nibbling at something on the mast. By my estimations he was 3+ ft long (other divers said 4ft). He could still be seen at the 70 ft and 60 ft stops. He was mocking me. The great white hunter would have to come back to this wreck and teach him some respect. I encountered divers a the 10ft stop. Apparently one diver’s computers had failed, and he was now doing a worst case deco plan. (Don’t leave the surface without one.) Once the last diver was onboard, John jumped in and pulled the hook. He did not have issues with the mast, but had to ride it up over some lobster buoys. By the time we were underway most of the divers were asleep in the racks or benches. We pulled in and unloaded our gear. This had been another great dive, but no dinner.